The nostalgic Bird T-Bucket Plans include such unique features as how to scratch-build your T-Bucket frame using inexpensive 8 gauge sheet steel rather than rectangular steel tubing, how to use a ’49 to ’53 Ford front end assembly to construct your own tubular front axle with hydraulic brakes, and much more including the history of Bird Engineering/Bird Automotive, from its go-kart and mini-bike kits to T-Buckets and beyond. All in an incredibly informative, useful and fun 49-page eBook you can download right now! In the ’60s and ’70s every hot rod loving baby boomer day-dreamed about a Bird T-Bucket. Back then, most every red-blooded American boy had three things on his mind: girls, sports and hot rods! To feed that insatiable interest, along came a new hot rod supplier — not from southern California, but from the small Midwestern town of Fremont, Nebraska. 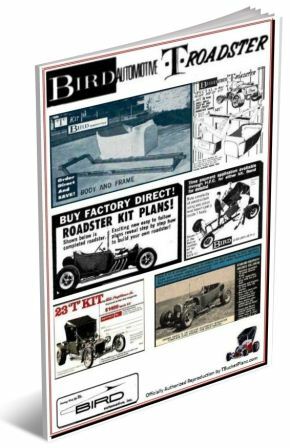 Who could resist the urge created by the 1965 Bird Engineering ad announcing a new Bird T-Bucket kit for only $169.95: at just $10 down and $9 a month, no less! And, to show you how easy it was to build your own hot rod on a part-time grocery bagger’s budget, they also offered their own unique Bird T-Bucket plans, which were very comprehensive for the day. (Of course, no plans are as comprehensive as Chester Greenhalgh’s “How to Build a T-Bucket Hot Rod Roadster for Under $3000“, but that’s another story). How to scratch-build your T-Bucket frame using inexpensive 8 gauge sheet steel, rather than rectangular steel tubing. How to choose a rear axle and add batwings for rear radius rods. Using the frame itself for the front and rear spring perches (no additional brackets). Construction of tubular engine, transmission and cowl/firewall/steering box mounts. How to build a cool combination brake and clutch pedal assembly. How to use a ’49 to ’53 Ford front end assembly to construct your own tubular front axle with hydraulic brakes. Simple construction of front axle batwings and front and rear radius rods. Mounting the steering box, steering wheel, pitman arm, drag link, tie rod and how to choose shocks (if you wish). Wiring, construction of windshield frame and choosing gas tank. How to mount a one-piece fiberglass seat/floor/transmission tunnel/firewall support. And much more — if you like seeing how things were done “back in the day” you’ll absolutely love the Bird T-Bucket Plans. The history of Bird Engineering/Bird Automotive, from its go-kart and mini-bike to T-Buckets and beyond. A collection of truly nostalgic Bird ads that were run in Hot Rod, Rod & Custom, Popular Hot Rodding, Car Craft and other magazines from the 60s to the 80s. Plus, a special surprise bonus 7-page section that every T-Bucket fan will find fascinating. All wrapped up in an incredibly informative, useful and fun 49-page eBook you can download right now. All this valuable T-Bucket hot rod building fun information is now yours for only $5.99. Just click on the “Add to Cart” button to securely purchase these informative and interesting T-Bucket plans through PayPal and then immediately download loads of great T-Bucket hot rod “how to” information. Once you’ve completed your payment using PayPal’s secure server you’ll receive an email with your personal download link and instructions for downloading your plans along with your receipt number. Thank you, and don’t hesitate to use our Contact Form if you have any questions or problems.